And, so I put the listing on my watch list, and waited to see where it would end up, and if I would have a chance to win the auction. After installing glass tile in the shower the last three days, I knew that the auction would be coming to a close soon, and checked out where the price was. With 18 minutes to go, it was at 66 dollars. 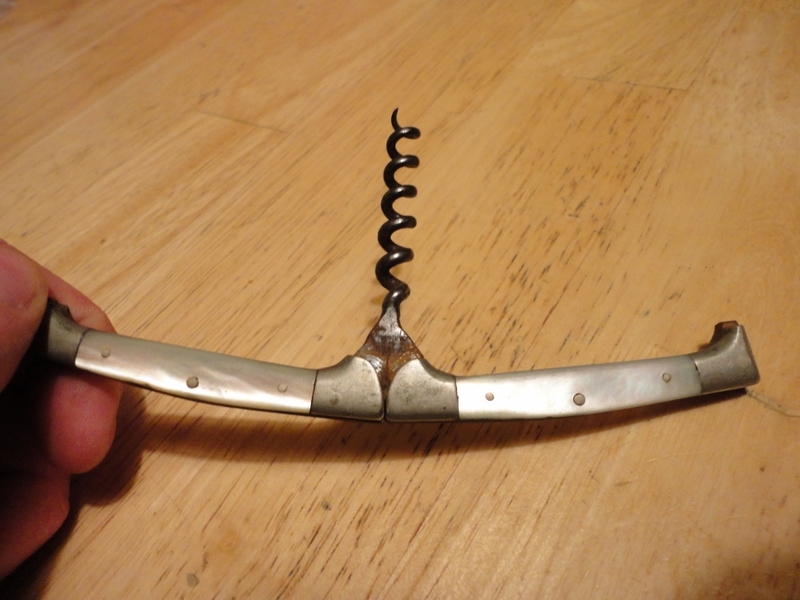 With time down to about 5 minutes, I placed a bid… I have never seen this particular corkscrew sell…but it is Sterling, and it looks pretty cool. As it happened, I was (at the time) the high bidder. Of course, we all know what is going to happen. All of the snipers would be coming in at the last minute–or so it seems, in the last 5 seconds. So, I watched the last few minutes wind down, and with a minute to go, threw out a much more substantial bid. I mean, if the snipers are going to snipe, I might as well give it a little padding. And, then it happened. Or, rather, nothing happened. There were no other bids or snipe bids, and the lot will be heading to the island! And, so the hunt for an appropriate peg is still on! So… yes TWJ, it will be accompanying me to Nashville, and hopefully there will be some interesting tradebait on your end. 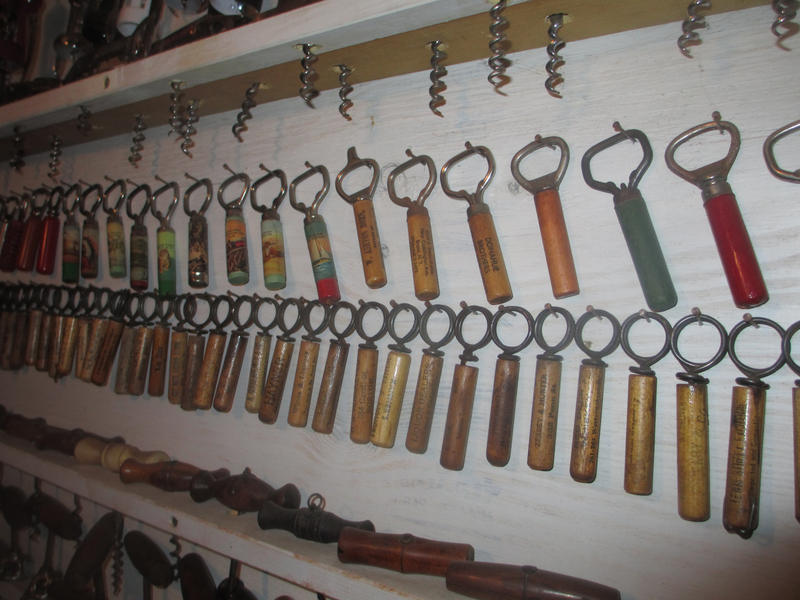 Could it be, that I have finally piled enough in TWJ’s pile to net out the Rainer corkscrew?????? 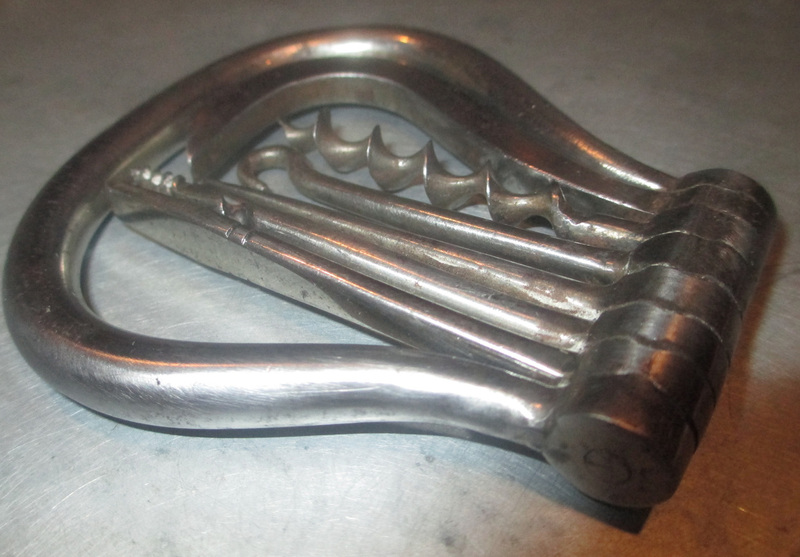 During my recent visit to my NH collecting friend, I picked up a Walker peg and worm, that was missing the peg. 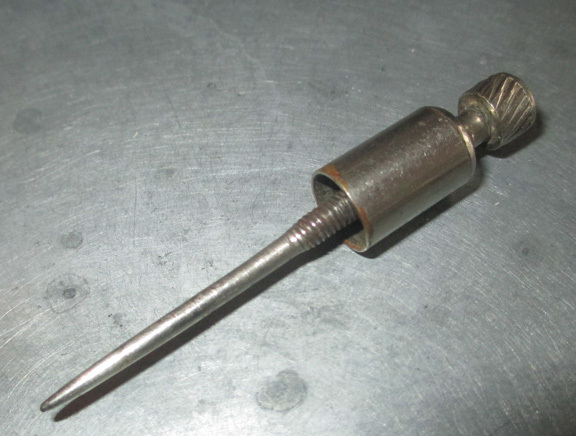 And, I do have a Walker Peg and Worm without advertising, but I am not inclined to separate the two, so hopefully someone out there has a Walker peg needing a screw, or perhaps a Walker patent peg with a damaged helix, that might be willing to part with it. When I first picked this up, I saw that it was an advertising piece, and saw the word Cadillac on it, and figured I would do a bit of research later. 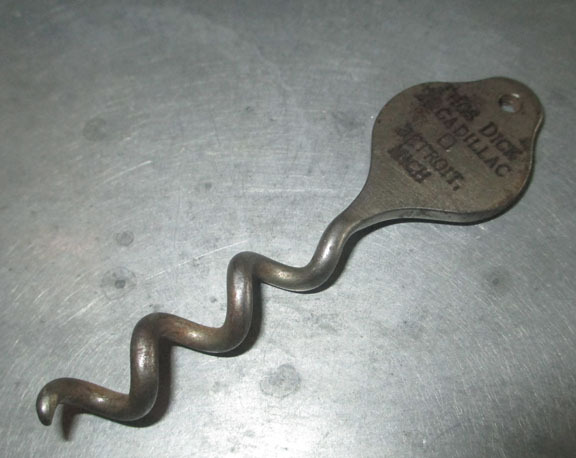 And, this morning I did a bit of searching on whom might be advertising on an 1898 patented corkscrew. 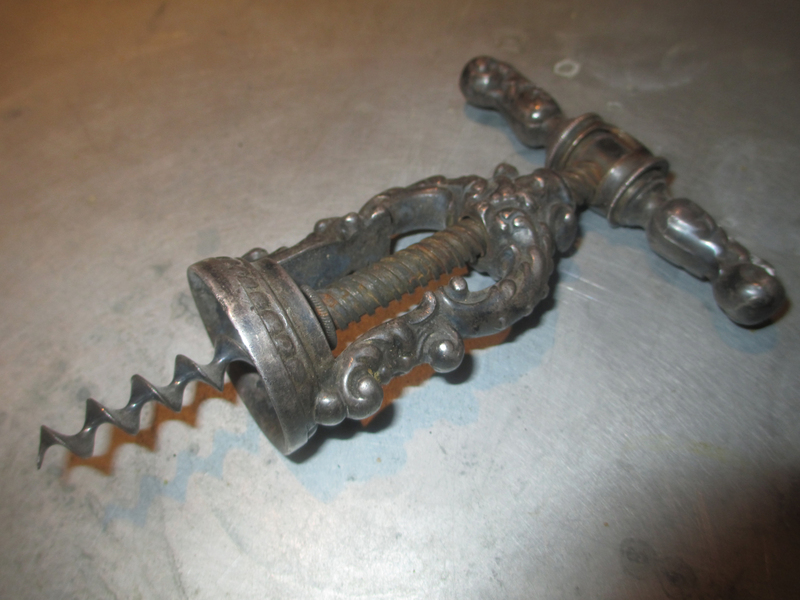 If you have a peg that will fit this corkscrew (and I mean the appropriate one, not some random one) I would be interested in trading for it. Yes, March Madness is upon us, and while the above score is merely a prediction, this time of year college basketball and brackets seem to dominate conversation—not my own mind you-but you do hear a lot about the tournament. Of course, there is another madness going on it seems. Check out Tommy’s blog! 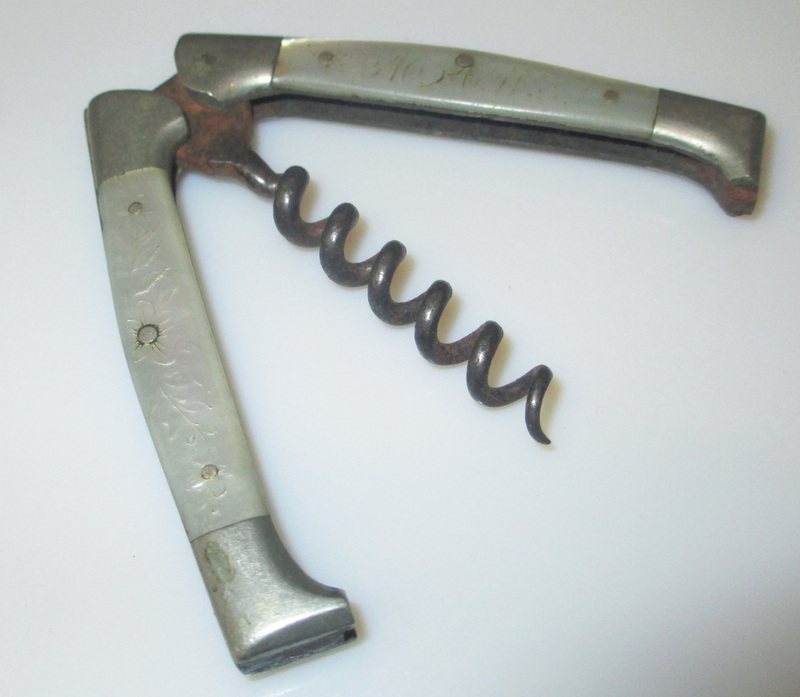 154 Williamson Flash corkscrew in a single purchase, rare wallmount corkscrew and patent wannabe can opener / corkscrew, Strait patent, Syroco…. WOW! That is a truly crazy deal! 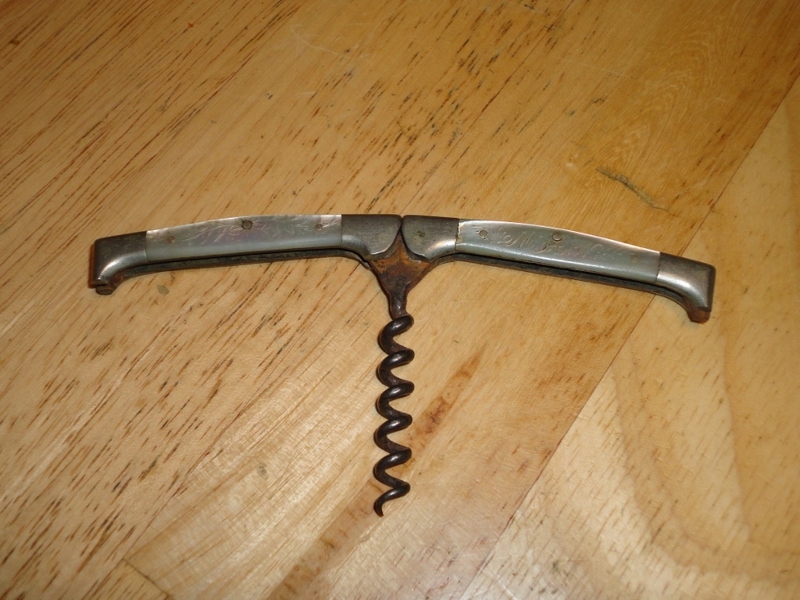 On another less crazy corkscrew note, the mother of pearl folding corkscrew arrived this afternoon and it is fantastic. 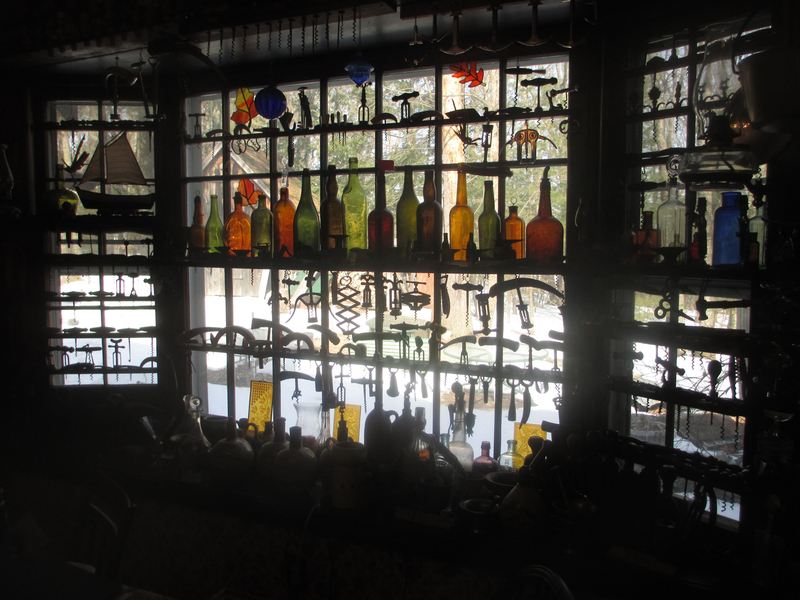 Beyond putting up the walls in the master bedroom, I have spent the last couple of days putting up the finishing touches on the latest edition of The Bottle Scrue Times. With a final round of editing to go, it hopefully will be at the printer in a couple of days, and then will be mailed out shortly thereafter. Meanwhile, there have been a couple of arrivals. Another Davis with advertising for Minneapolis Brewing. I really don’t know why I keep buying these, as this is the fourth identical one–but, perhaps they will go well at the JFO in a couple of weeks. Also, there is a Rydquist patent, a flash (most likely for Tommy), and that 6 tool bow mentioned the other day. 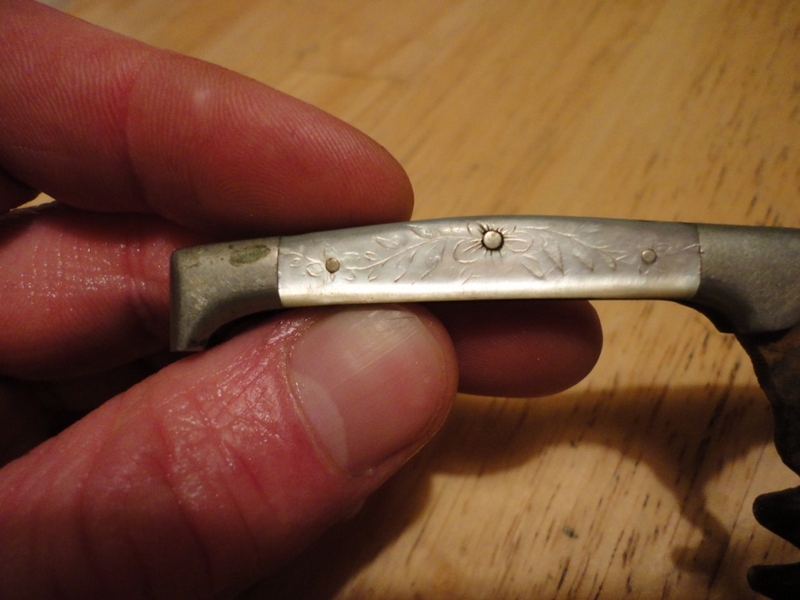 The bow is indeed an interesting one, as at first I though perhaps the hoof pick might have been broken off, however after looking at the photos closely, it would have to be this shape to allow for the other tools to fold into the bow. 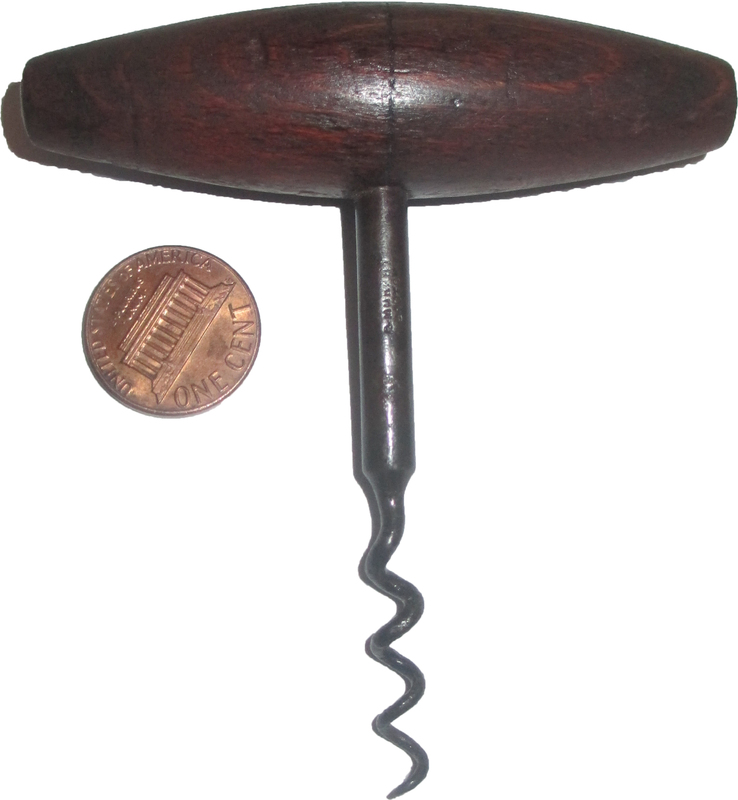 Now that it has arrived, it definitely was made to have this shape, and it is quite the handsome corkscrew with its rounded hinge. Today is the first day of Spring, and this morning I spent a couple of hours digging out from about 12 inches of snow that fell yesterday and overnight. And, there is a chance of more snow on Friday. It is supposed to be Spring, isn’t it!?! 12 days until Baseball Season starts go Giants! 21 days until the JFO meeting begins in Nashville. 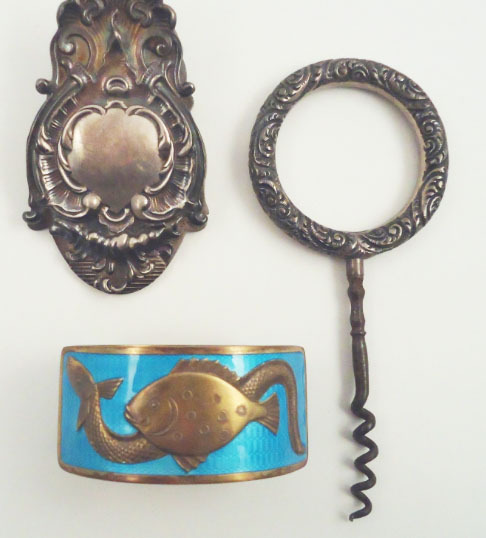 55 days until Brimfield Antiques show! Today is a non-construction day, as I am heading off the island and heading to Portland for the evening. I may be able to hit a couple of antique stores on the way down, and who knows what might turn up. After spending the last few hours sanding the pine which will ultimately be whitewashed and put up as the walls in the master bedroom, I decided to take a few minutes and check my email and such. And, of course, how could I not check eBay. 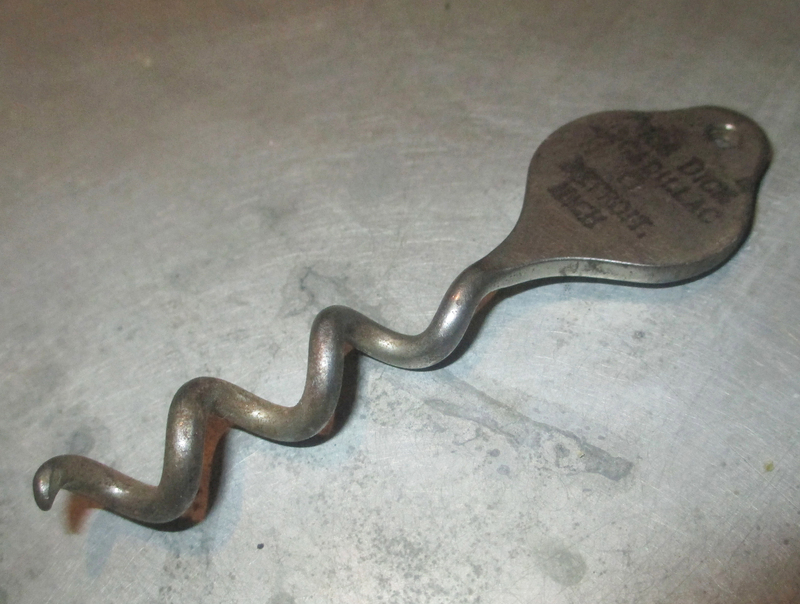 And, as fortune would have it, there was a corkscrew just listed, and the seller had decided to list the item as a buy it now on the corkscrew for the whopping price of $ 34.99. Now ordinarily, I would have taken the time to look at all the pictures and read the description before pouncing on an item. This time, I didn’t hesitate. I was sure that it would be gone before I checked the other pictures. And, then I revisited the item. In looking at the photos, I was definitely pleased to have hit the “buy it now” button. The helix is complete, the mother of pearl has no cracks whatsoever, and there is actually some floral embossing and a monogram on one side of the mother of pearl. 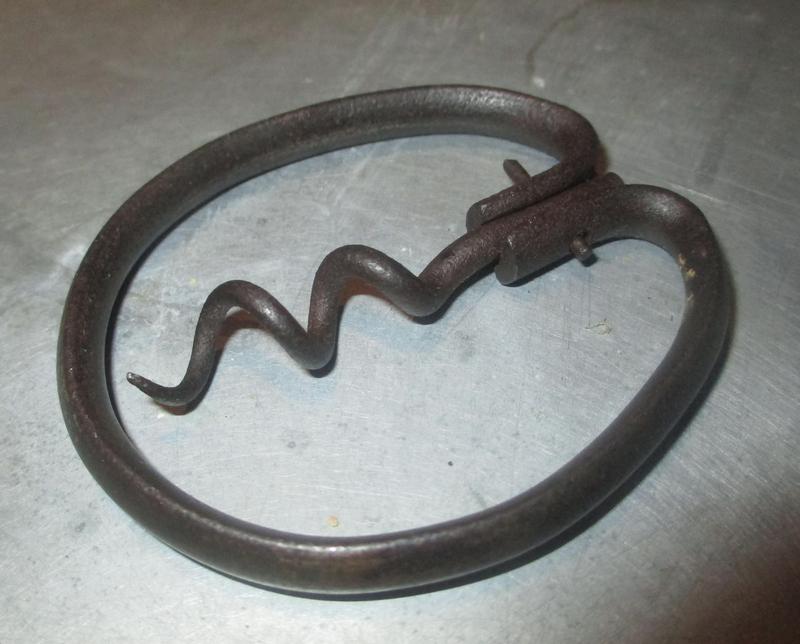 The corkscrew was listed as: Antique 1890s GERMANY Rencke? mother of pearl cork screw. And, Rencke, if one looks closely at the mark, is actually Henckels. 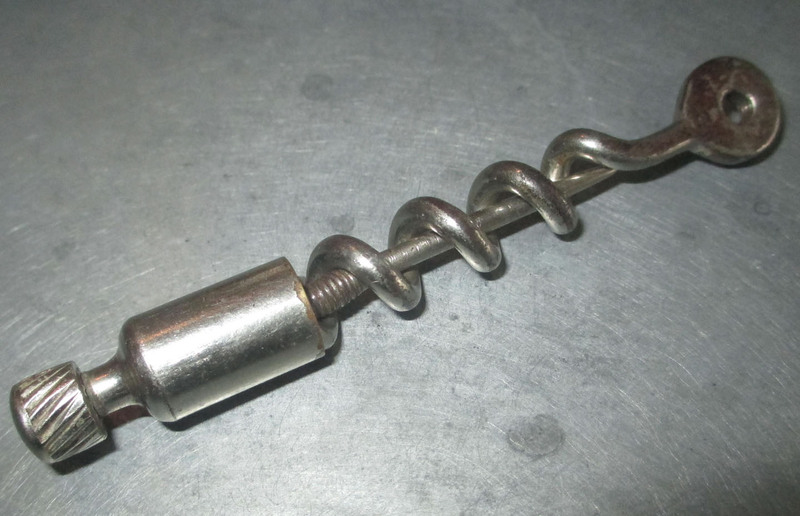 An awesome corkscrew, at an awesome price. 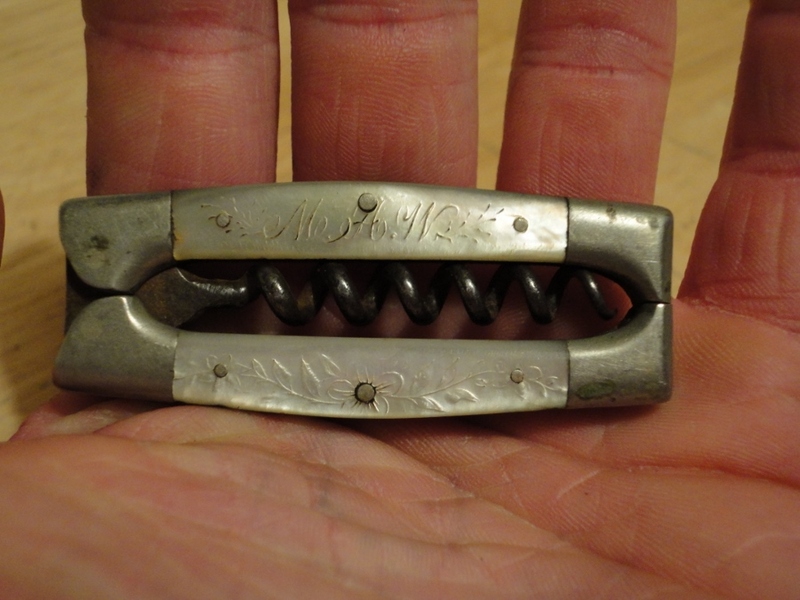 Now, we just need to figure out who the corkscrew might have belonged to… The initials look like M.A.W. So who could it be? 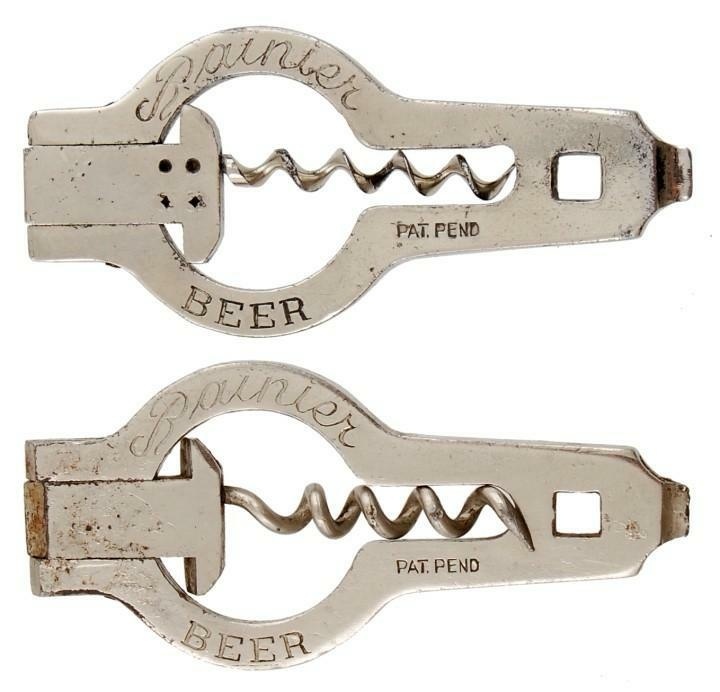 On my way back home from NH, I happened into one of my favorite antique stores, and after perusing the booths and cases on all three floors, the manager of the shop told me that one particular seller was having a 50% off sale, and explained there was a “non-listerine” medicine corkscrew in that particular case. 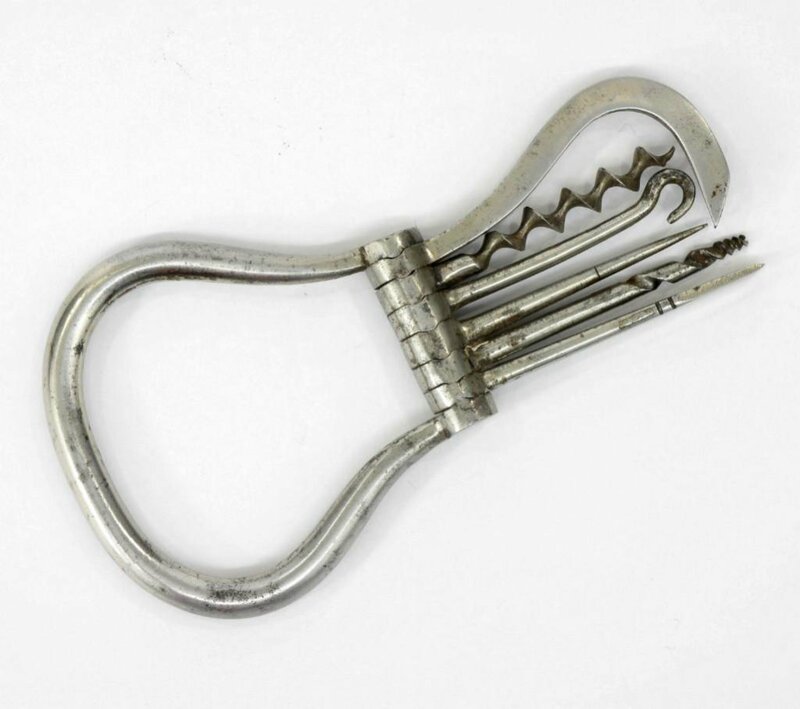 I said I would like to see it, and asked if I could have a key to the case. Now, no antique mall has ever offered to give me the keys so I can help myself, but not for a lack of asking. I figure that I am in there often enough, I might as well have my own set—but I digress. 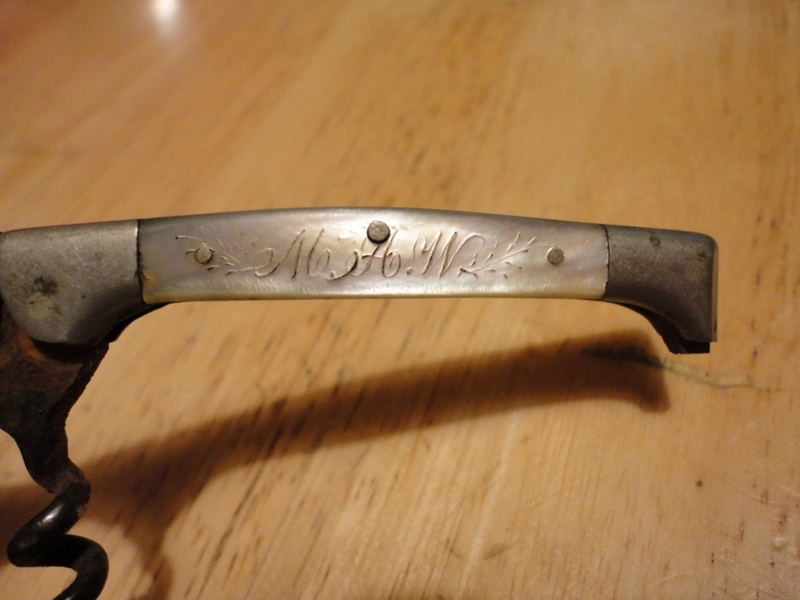 We walked over to the aforementioned and found the medicine corkscrew; a simple 1884 Clough corkscrew with advertising for “Z.M.O FOR PAIN.” At half price, it was definitely worth the price, and shortly after making the purchase I was back in the car heading towards the boat. 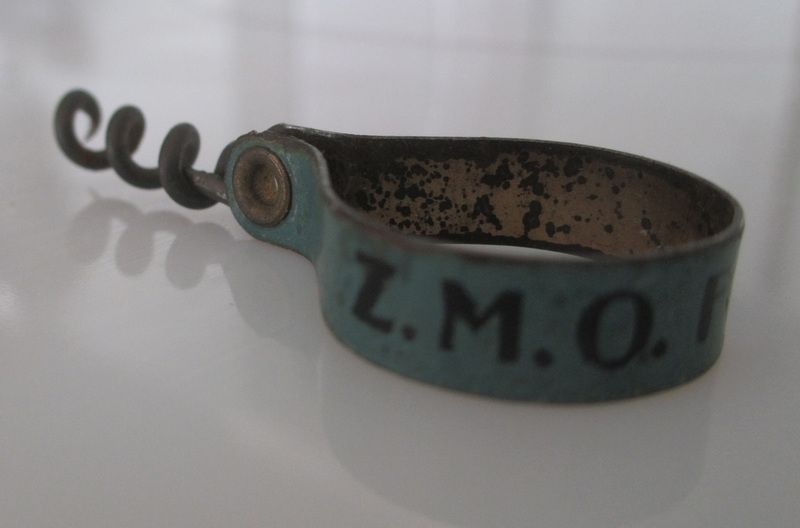 Z.M.O. 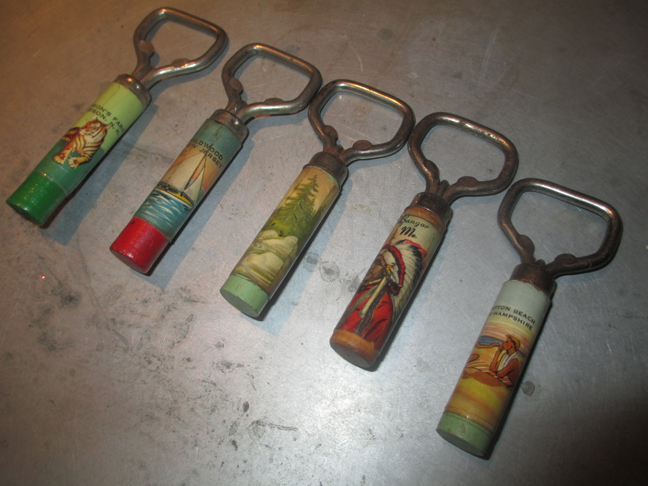 which is still produced today, stands for Zaegel’s Magic Oil, produced by Max M. Zaegel of Sheboygan, Wisconsin. And, the Magic Oil has an interesting history. The company’s website features the transcription from a pamphlet from 1903, written by Zaegel himself. Sheboygan, Wisconsin, a city situated on a high bluff on the shores of Lake Michigan, decided to put in a system of sewerage and water works. In front of Mr. Zaegel’s drug store, situated on a prominent corner of the main street, the trenches dug were very deep, and in order to interfere as little as possible with the traffic, quite narrow, giving the men employed anything but an abundance of room to perform their arduous duties. With conditions as above described, accidents, in spite of all precautions adopted, were unavoidable, and one day a workman so employed was brought into the drug store with an ugly wound caused by another workman striking a pickax through his hand. As before stated, this was an ugly, lacerated wound much worse than that caused by any sharp instrument, and not only very painful, but most difficult to heal, and bleeding profusely. Mr. Zaegel was personally present in the drug store at the time, and was requested, in the absence of a surgeon, to give such temporary treatment as might be necessary. As the man showed evidence of fainting, caused by the shock and pain, he was lead to a chair behind the prescription case and the wound was carefully cleansed with a sponge and warm water, and a little brandy given to revive him. Mr. Zaegel then, upon carefully examining the wound, determined (in the absence of a surgeon to apply the customary stitches) the only thing to do would be to apply some preparation that would possess the following qualifications. 1) It must be of an astringent nature to stop the flow of blood. 2) It must possess anodyne properties to relieve the pain. 3) It must contain antiseptics to prevent the formation of pus or matter, and so give nature an opportunity to repair the injury done. With these three essential features in his mind, he took a one ounce bottle out of the case and made a combination of oils from the many bottles on the shelves. Upon his return to the man he applied a wad of cotton to the wound, and upon saturating the cotton with this oil, all present were pleased to hear the man utter an exclamation of joy and ease, as the moment the oil penetrated the wound all pain was gone and the bleeding stopped as if by magic. That is certainly some powerful (and magical) stuff!!! Interestingly, Z.M.O.’s current website also offers this disclaimer before providing the history. “ZMO Oil is an external preparation. This 1903 history describes internal uses which are discouraged by The ZMO Company.” In other words, don’t drink it!!! 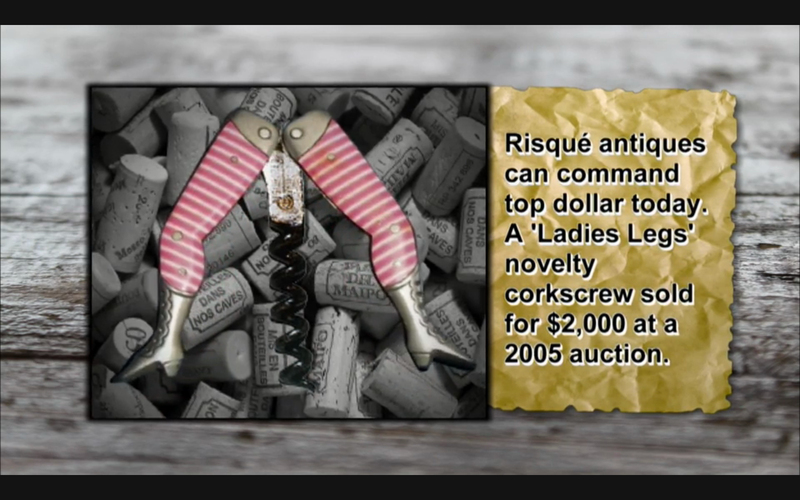 Well, it has happened again, another corkscrew has turned up on American Pickers. 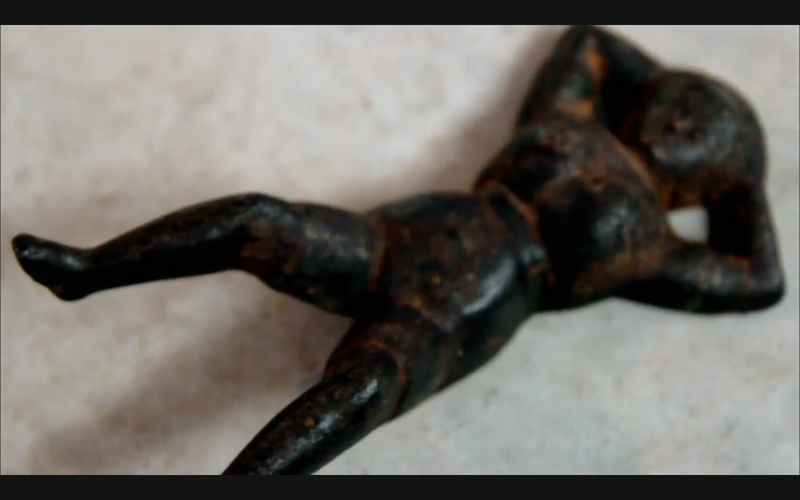 On the most recent episode, which aired Monday night–and now is available online if you can find it–Frank and Mike find themselves in the middle of a pick where they run across some bootjacks known as Naughty Nellies, and while the discuss the use of this type of boot jack, an image of a pair of ladies legs flashes on the screen with an explanation that at an auction in 2005 a pair of corkscrew legs brought $ 2000.00. Really? $ 2000 in 2005. Could you not find some more recent sales information, I mean it is only 8 years later. I hate to belabor the obvious, but how about giving some more recent (and accurate) pricing information, like they sell for several hundred and the pink and white ones you chose to use aren’t exactly the $ 2000.00 dollar variety. 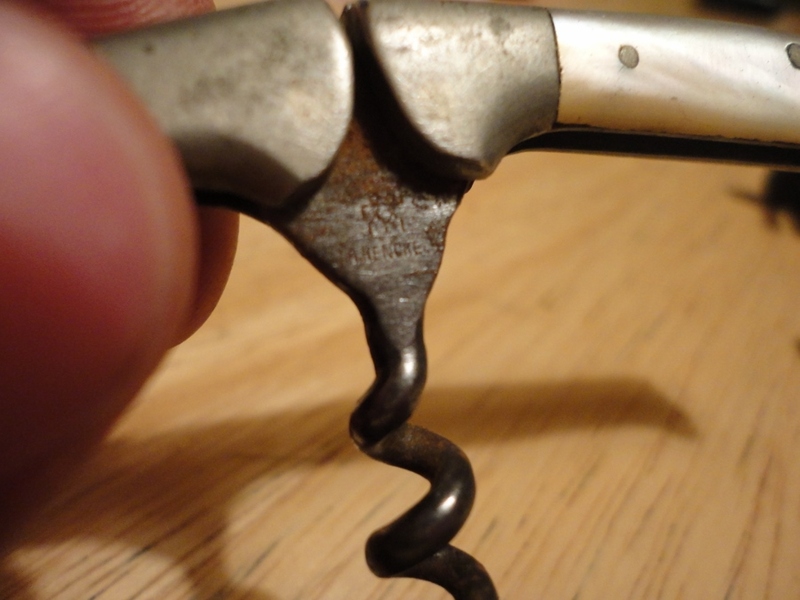 That said, at least they are showing a corkscrew! Of course, What makes this episode more special however, is that in the credits–which if you blink you would miss them–they show the names of the places from which they acquired the images. 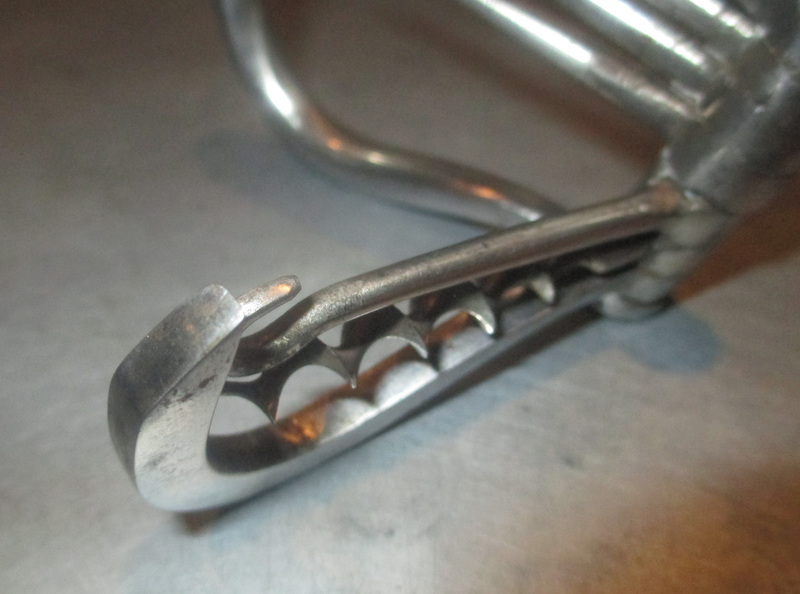 And, what name is up there but Era Corkscrews. Yes, our man Gavin has made it big!!! Congrats Gav!!! I will add, that Gavin did email me to let me know that he was contacted by the company that produces the show, so I knew to look for his name “in lights.” Very cool Gav…very cool. 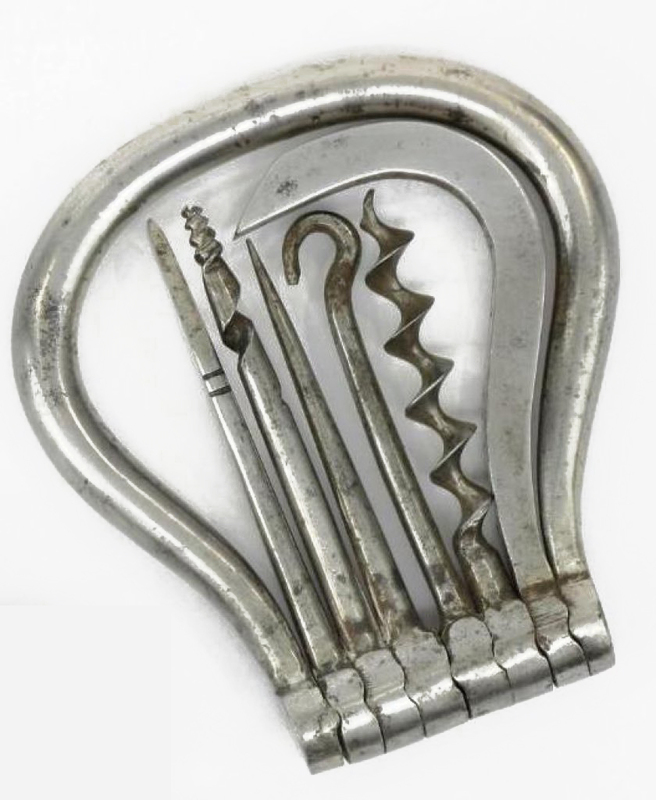 Of course, I am still waiting for Frank and Mike to actually find a collection of corkscrews, but since they have picked up one in the previous episode, and are using an image of one in the most recent episode (Cheap Picks), perhaps they are getting closer. 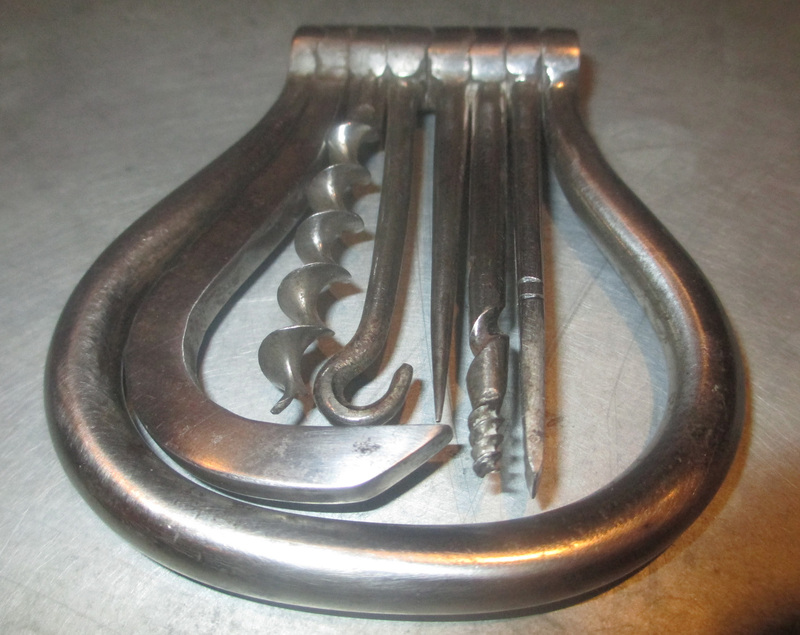 …but in looking at the pictures if it was longer it wouldn’t allow for the other tools to close. I am guess it was made this way. When it arrives in a couple of days, I will examine it more closely. The lovely personal trainer and I drove down to Portsmouth, NH on Sunday in anticipation of a flight to Las Vegas for her–to a personal trainer’s conference, and knowing that I had a bit of time before I had to head back home, I headed over to another collector’s house for a bit of trading/buying/selling. The collector, who doesn’t do any of his hunting/buying online, was given my phone number by Don Bull. And, he called a couple of weeks ago asking if I wanted to come by. When he said his name, and gave his location, I asked him if we had met before at an antique show in New Hampshire. After a few moments of back and forth, we agreed that it was a Sunday show where I had beaten him to a couple of corkscrews. On the phone he had mentioned that he had a few American patents, and several Murphys, one of which was very very cool, as it is the smallest Murphy I have ever seen. 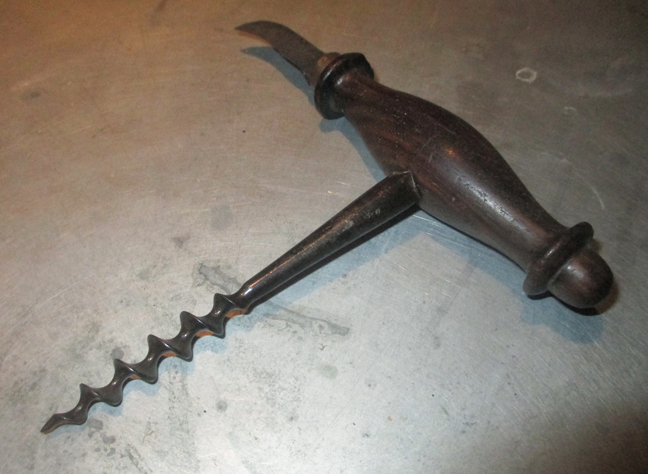 I did make an offer to buy this particular corkscrew outright, but my host was not parting with it. 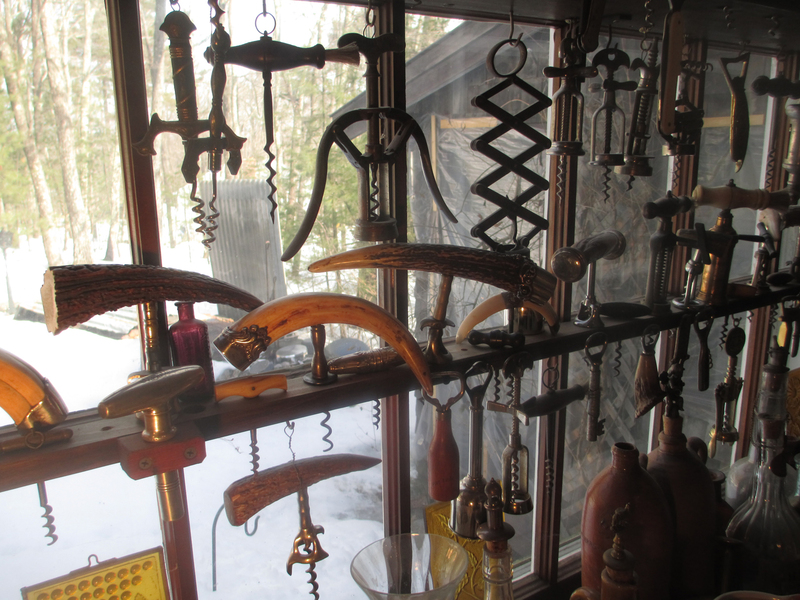 Corkscrews in the kitchen, corkscrews in the dining room, corkscrews in the living room, corkscrews in the hallway, corkscrews on the way down to the basement… The sheer mass of it was pretty impressive. The first piece I actually picked up was a Walker Peg and worm with advertising for a Cadillac dealership in Detroit. He, of course, knew that it was a Walker patent, but apparently wasn’t attached to it. And, suggested I put it in “my pile.” As he was going through the box of stuff I had brought, and creating a pile of his own. 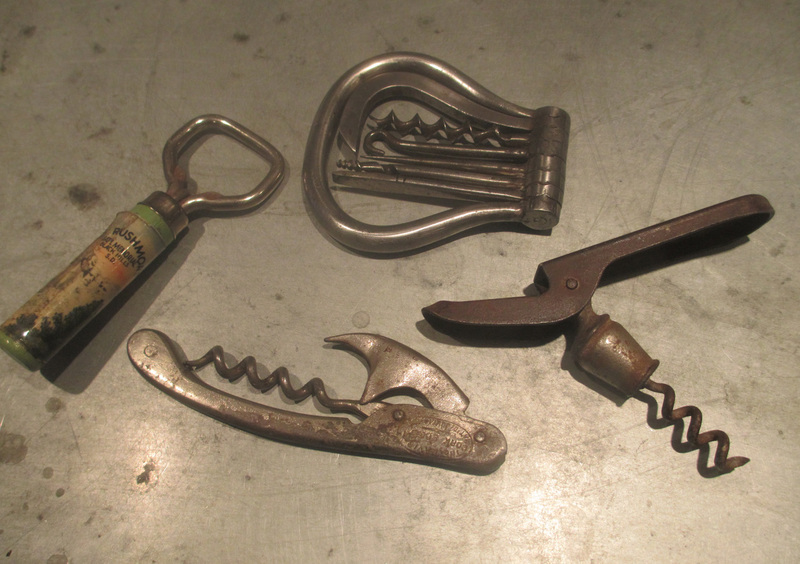 I decided to pick up a couple of items that were not in groups–as corkscrews were definitely grouped–here are the Walkers, here are the mechanicals, over there are the folding bows. 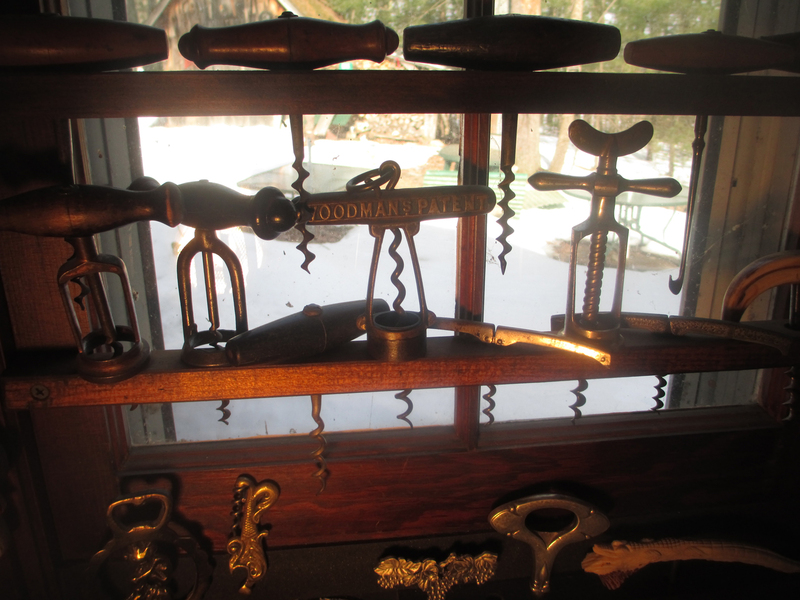 I would place a corkscrew on “my pile.” And, by the time I returned with another corkscrew, my pile had become smaller as he had moved it over to another location–apparently these too were not tradable. Now, his pile wasn’t huge either, but he had selected a Korker in the original box, an H & B with brush, a nice German Spring, a Champagne Nippers with Brush on the handle, an interesting Italian mechanical, and a few other bits. 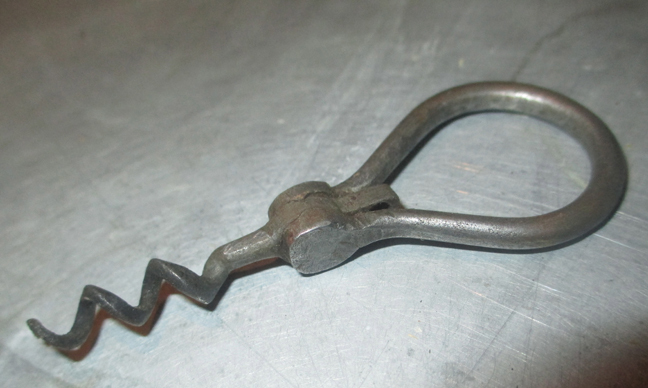 In the end I did come away with some interesting little corkscrews, and will call on him again when I am in the area. Here is what came home to the island from my visit yesterday; a wooden T with blade marked J.H. Schintz, the Walker Peg and Worm, missing the peg–but I have an extra, a Williamson patent folding bow, a miniature folding bow with hanging ring, 5 flashes for Tommy (he had 9, but I picked one’s that looked interesting, and a fancy Reissmann patent that often turns up in people’s Frary collections. 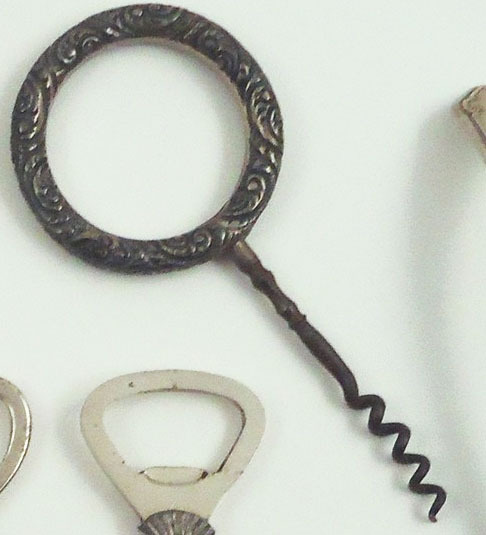 The Reissmann was a funny exchange, as when I was going through the collection, the phone rang, and I overheard the collector say, “sure come on over.” Apparently someone in the area had found a “elaborate corkscrew, and wondered if he was interested. The caller arrived, and after a bit of conversation the Reissmann was purchased for a 20, and ultimately ended up coming home with me. It was really fun to see someone else’s collection. 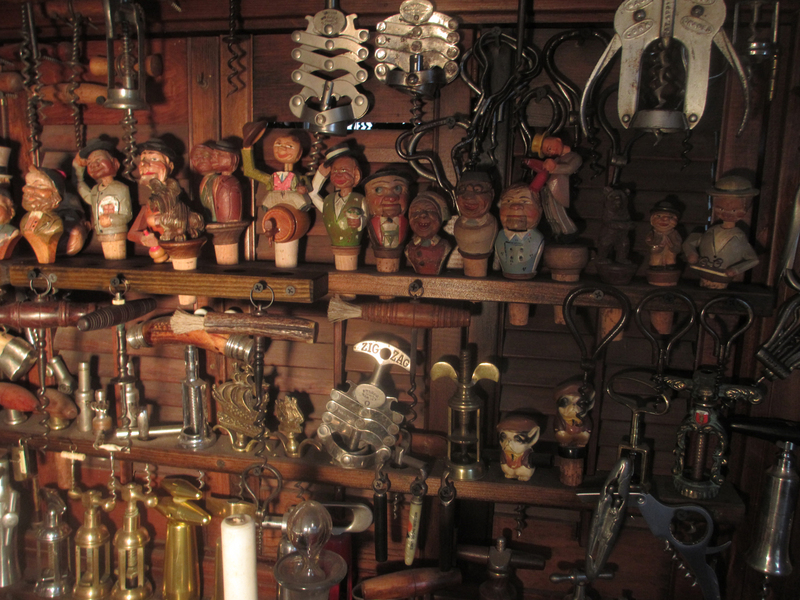 And, his collection is definitely impressive given that it has been entirely acquired through diligent hunting at flea markets, antique shows, and shops and malls in the area. Tales of great finds were shared, a glass of Chianti consumed (it was a bit early, but how could I refuse the hospitality), and both of us felt good about the trade. Thanks for the reference DB!! !